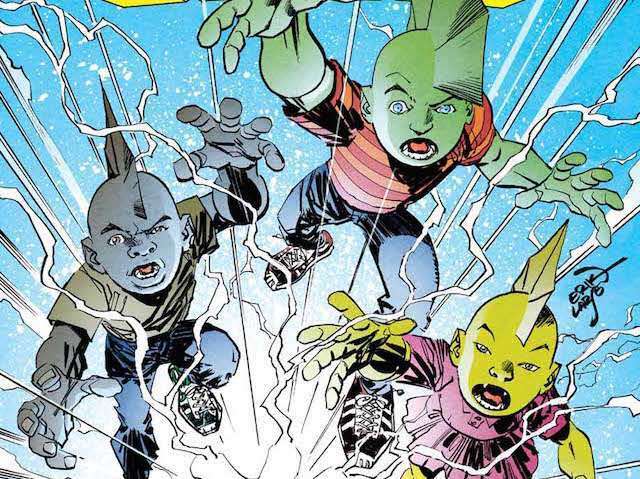 Earlier this week, Savage Dragon #236 featured Malcolm's children -- Jack, Tyrone, Amy, and the newborn Maddy -- took center stage in the comic, featured in a number of double-page spreads inspired by Bill Watterson's Calvin and Hobbes Sunday strips. The story had stakes -- the kids went missing and had to be found, while facing their own obstacles during their side adventure -- but there was no serious global or cosmic threat, and nobody trying to kill most of the cast. That (and the reappearance of some long-missing cast members) makes the issue a bit of a calm before the next storm, and the issue sets up a lot of future storylines. Larsen joined ComicBook.com to discuss the issue, which hit the stands on Wednesday. Spoilers ahead, of course. You can pick up a copy of Savage Dragon #236 at your lolcal comic book store or a digital version at the Image Comics website, or ComiXology. Did the idea of doing a subplot with the kids come first, or was it precipitated by the Calvin and Hobbes idea? I knew that I wanted to do an issue which focused on the kids but it wasn't until I was getting ready to start drawing the issue that I decided to do something of a Calvin and Hobbes Sunday Page approach. Initially I was thinking of doing a Dennis the Menace riff but I thought too few people would get what I was doing and I decided I'd rather have something where I could do spreads that looked visually different as opposed to single pages. With so much plot going on lately, it feels like it has been a while since you did an "experimental" issue. Were there any particular surprises as you did this one? It had its own set of challenges because unlike real Sunday newspaper strips there was the binding, staples and centers of books to contend with so I couldn't have word balloons sitting in the middle of the spread without fear of them not lining up correctly. I actually page through tons of Calvin and Hobbes Sunday strips to find layouts which I could emulate. Some are pretty close while some stray quite a bit--but those strips were the initial inspiration. This issue sees Angel and Alex show up, introducing them for the first time to Malcolm's post-Trump status quo. Will it take a while for them to get acclimated to Canada or is the plan to have that happen largely between the panels? I'll cover things as best I can but I can't really play anything out as thoroughly as I might like. There simply isn't the space or the time, really--one of the pitfalls of setting a book in real time is that each issue has to cover roughly a month and characters really don't feel that that out of place for that long a period of time. A few weeks, really, is all that it takes. Angel says what a lot of the readers have been thinking: that whatever is going on with Maxine, it isn't normal. Is that something Malcolm has been in denial about or had it genuinely not occurred to him? I think he's in denial to some extent. But more than that--he's been pretty stoked about the whole circumstance. On his end--this has been working out great. He's young and insatiable and she's that and more so as far as he's concerned this has been nothing but awesome. The family seems to be getting better at avoiding the cameras...but we have seen an upcoming solicitation where it seems the cat is out of the bag regarding Maxine's "resurrection." Is the reality show element going to start really messing with their lives in a different way soon? It can't help but go that way. Invariably, things will get out which they don't want to get out and that's going to make things really difficult. Angel said a few things casually, without a second thought which could come back to haunt her, including implying that Jackson was her son and intimating that Maxine and Malcolm once had a more open relationship. I like the way the thing with the kids is resolved; are we going to see more from the world they visited at some point, or is the plan right now to have it be a one-off? I don't imagine that I'll be taking the kids back right away but this is very much the sort of thing I can imagine returning to down the road. This is one of those kinds of things which I can see them remembering in the back of their heads and thinking was a dream or an imagined world but they could rediscover years later. We got a glimpse now but it could be something bigger when they return. Marsha is having none of Maxine's overtures. Will we start to see some different dynamics emerge as the size of the Toronto ensemble grows? Oh, sure. Building a cast can be a long process. The roomful of characters we saw briefly when Malcolm and Maxine first moved to Toronto will be gradually fleshed out. And there'll be plenty more. What was up with that dog? Was it really some kind of freak or was it just a style choice to give it a sense of Watterson adventure/menace? I was thinking some freakish junkyard dog type, possibly akin to Buffalo Stu from earlier. As with Chicago early on I want to establish the kinds of things that are out there. Speaking of which, it's been a while since we saw the Demonoids take center stage. Are they ready for a comeback? Yeah. Most of the underground types we saw in the 190's are present up in Toronto as well. So while we won't see the same exact Demonoids that we met earlier, their race does exist North of the border and their agenda is much the same. Whatever is going on with Maxine -- which now seems to be actually impairing her ability to function -- has that been a longterm plan all along, or did it become a thing you decided to explore after you had played with her sexuality for a little bit? Much of this story is building on seeds planted earlier. One thing leads to another. Very seldom do I have a huge, sprawling, long term plan all mapped out. More often big stories grow from germs. Often it's like real life. You have an idea of where you want to go but things crop up and life takes off in some unexpected direction. And each little thing can lead in any number of directions. It's funny but often the things I do thoroughly work out beforehand don't work out as well as those where I just wing it. Things can feel predictable when they're meticulously planned out. It can feel like I'm just ticking off boxes in a list of plot points that need to be hit but when I'm just letting goings unfold it can be a wild unpredictable ride. Over the years I've learned to trust myself. If I paint myself into a corner I will inevitably find a creative and far more satisfying way out when I don't know all the answers beforehand.